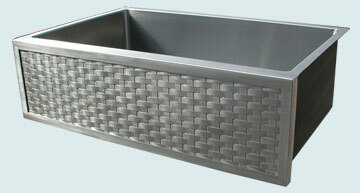 Custom stainless steel woven apron sinks from Handcrafted Metal add sparkle and texture to compliment your cabinets. Each feature can be customized, including the number, shape, and size of the bowls. Choose from additional features, such as backsplashes, drain boards, and towel bars to further personalize your sink. You can combine features to build your own perfect sink! Add a drainboard and a back splash, and change the dimensions to fit your space. 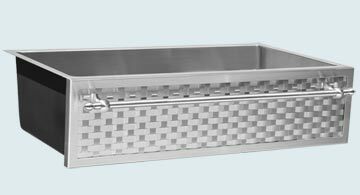 All sinks are available in drop-in mount, under mount, and flush mount models, and our premium 14 gauge stainless bowls feature coved corners inside for easy cleaning. 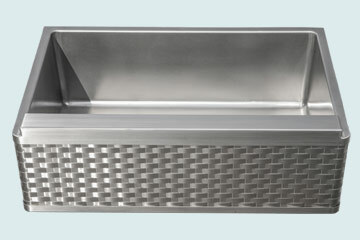 If needed, we can make a stainless steel sink into a stainless steel countertop so that no visible seams will be between the sink and the top, and we can easily add a custom drain board on undermount sinks and apron sinks. Also, if you need the apron front of your stainless sink to fit with existing cabinetry, we can make it match perfectly! Click on any sink below to see more photos, and enter the dimensions you need to get an instant price. 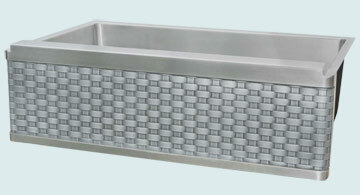 The custom stainless weave farm sink includes a towel bar. This 33" bowl has a 35" apron and is ideal for standard 36" sink bases. All interior corners are soft curves for easy cleaning. The sink is 14 gauge stainless, and both the sink and apron have our micrograin finish. This simple design and sparkling woven stainless apron panel brighten this undermount farm sink and provides great contrast with darker cabinets. 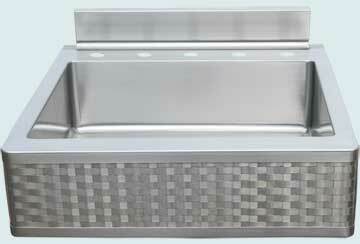 The sink is 14 gauge stainless steel, and both the apron and sink have our micrograin finish. Smooth stainless inside the sinks and around the apron contrast the texture of the hand woven panel and the towel bar. The smaller sink is more shallow for scraping dishes or preparing food. It has our Micrograin finish on 14 gauge stainless. 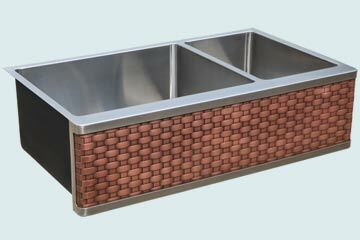 This eye-catching custom single-bowl farm sink features a raised apron top and a woven apron. 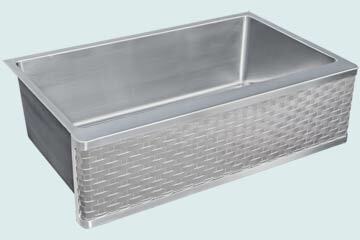 The sink is all 14 gauge stainless, and both the sink and weave have our micrograin stainless finish. This classic single-bowl farmhouse sink combines the beauty of copper with the sturdiness of stainless. The apron features a diagonal weave, and is perfect for any kitchen with a combination of metals. The sink is 14 gauge stainless, and has our stainless micrograin finish. We finished the copper weave with our medium patina. The hand woven insert curves around the ends of this framed apron. The larger left bowl is for dishes, and the smaller right bowl is for food prep. The sparkling stainless weave compliments the smooth interior. 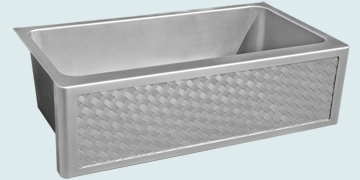 The sink and apron frame are all 14 gauge stainless steel, and both the sink and the weave have our micrograin finish. 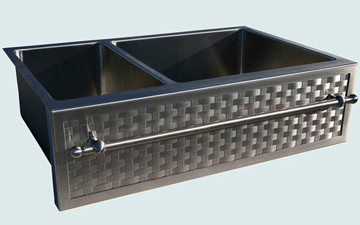 This single-bowl sink features an integral back splash and a woven stainless apron. The deck behind the sink provides plenty of room for faucet, sprayer, and soap dispenser holes. 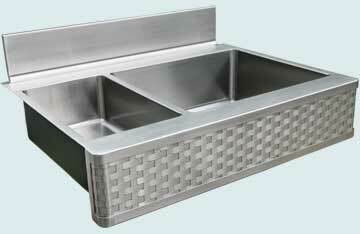 The sink is 14 gauge stainless steel, and both the sink and weave have have our micrograin finish. This extra large custom sink holds its own even in the grandest of kitchens. The apron features our hand-made woven stainless panel and a bullnose apron top. This sink reaches to the wall, and the deck behind the sink provided room for fsucet holes. This sink is designed for the deck to mount flush with top of your counter tops, and to set between and adjoin the counter tops at each ende. 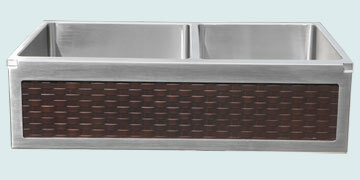 The sink is 14 gauge stainless, and both the sink and woven apron have our micrograin finish. 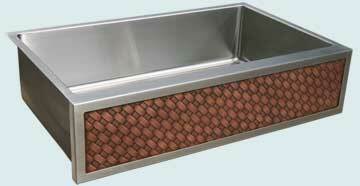 This beautiful double-bowl undermount sink features a hand woven copper insert in the framed apron. The rest of the sink is made from 14 gauge #304 stainless, and has our micrograin finish.